The story of Cinderella has been around for a long, long time. But, I didn’t realise how much of a rich and in depth history it had. The programme was informative. Once upon a time, the Cinderella story had its origins in China, more than 1,100 years ago, then there was an Egyptian version, an Italian and French interpretation, finally an English portrayal of the tale. Details of the story may have transfigured over the years but the “rags to riches” story model has remained. At its essence a young girl loses her mother, is bullied by her new stepmother and stepsisters, however with the collective assistance of her own strength and support from her mother’s memory, she triumphs over adversity and achieves what she thoroughly deserves. 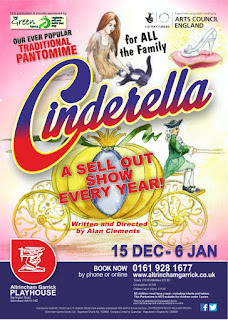 This is the annual, traditional pantomime at the Garrick Playhouse and overall it was very good. The cast of eight and chorus of children thrilled the audience of little ones. Beverley Stuart-Cole played The Fairy Godmother and cast a cheerful spell over the room. But for me her acting lacked spontaneity, she didn’t naturally respond to the crowd, her performance appeared very much set in stone. Kate Perkins’ Cinderella exuded kindness and innocence – her solo number mid-way through the first act showed off her strong singing voice and stage presence. Buttons (Liam Dodd) was the bell boy to Baron Hardup (Johnny Temple) – he hadn’t had his wages paid to him in five years! Dodd showed he is clearly a growing performer, capturing Buttons’ inner kid and tender need to make people happy. His interaction with the audience had a lovely energy. The two ugly sisters were Trafford and Etihad, portrayed by Phil Edwards and Max Fone. They played on the theme of Manchester United versus Manchester City throughout, which indeed brought lots of engagement from the Mancunian crowd. Both of them brought a belly of laughs, especially in moments of perpetual bickering. Edwards was undoubtedly easy going up on stage, not afraid to ad-lib a little bit and have a laugh. Sadly and surprisingly, Danielle Chester’s Price Charming was rather one dimensional, for the most part it felt like she read, rather than performed, the script. Her performance lacked the energy and oomph for a pantomime. Dandini (Charlotte Foden) made a notable, faithful servant to his Royal highness. Alan Clements’ traditional direction and writing emphasised the story and the morals woven into its fabric, balancing classic and contemporary jokes and sketches. Of course, “Baby Shark” was going to swim its way into the narrative somehow. I admired the local community theatre ambience throughout my visit. An aesthetically pleasing handmade, hand-drawn and painted set added to the fun experience of watching the panto – as designed by Laura McKie. I thoroughly enjoyed this production’s interpretation of the Cinderella transformation scene. The simplicity of the special effects worked beautifully. The whole thing was clever, magical, and spectacular. Definitely the core highlight of the show. 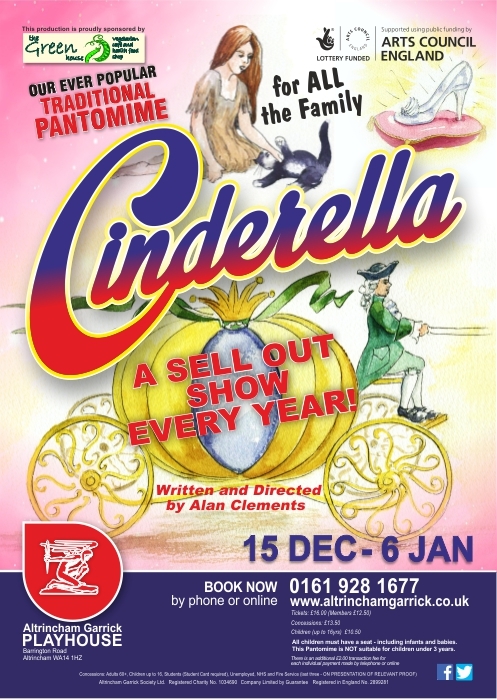 A local community theatre atmosphere tied together with the classic pantomime presentation reminded me of when I was growing up with my local theatre. Nostalgic, indeed. I don’t think anything will ever beat lots of children screaming frantically at the actors to watch out for the ghost that’s behind them. “We’ll have to sing it again then?” We shall. REVIEW: Polina (film) - HOME, Manchester. REVIEW: Ben Ottewell - The Wardrobe, Leeds. REVIEW: Peter Pan - Theatre Royal, St. Helens. REPORTAGE: Lightwaves 2018 - Media City, Salford. REVIEW: Wicked - The Palace Theatre, Manchester. REVIEW: The Cardigans - 02 Apollo, Manchester.